autoAlert is an innovative multifunction emergency light. 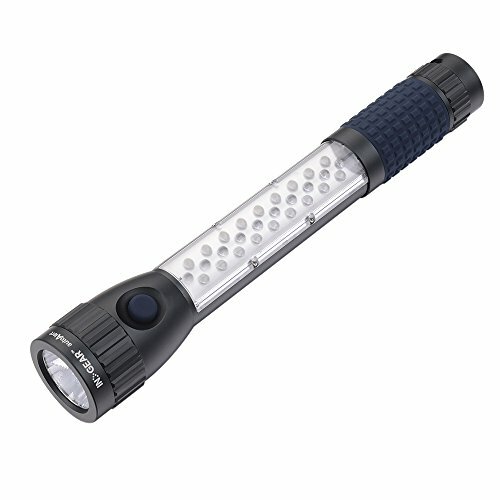 Beyond vivid high-low flashlight modes, its high-grade aluminum handle includes a wide-angle work light for under-the-hood tasks, a bank of high-visibility red strobes that can alert oncoming traffic of your location, and a strong magnetic base that anchors the light for hands-free work. autoAlert is a tool smart travelers want in their roadside emergency kits. PROFESSIONAL QUALITY, BUILT TO LAST: Upgraded from our previous model ("INGEAR 3-in-1 Car Safety Flashlight"), the 2nd generation autoAlert is constructed with military-grade anodized aerospace aluminum, designed to resist corrosion, drops, intrusive weather, and even the roughest roadside emergency conditions. Its brushed metal shell, designed to handle rugged use, also creates a handsome exterior. HIGH-POWERED FLASHLIGHT w DUAL MODES: In high mode, autoAlert's focused 220-lumen beam casts light on objects up more than 900 feet away. In the energy-saving low mode (up to 15 hours at 50 lumens), the beam provides ample light for navigation and close-proximity work. BRIGHT WORK LIGHT w STRONG MAGNETIC BASE: Built into the flashlight's core, autoAlert's array of 18 LEDs projects a swath of light that is both wide and deep-highly beneficial for making repairs in tight places and comes in handy under the sink at home too. At the base of the handle is a neodymium magnet, a rare-earth mineral magnet that is the strongest type of commercially available permanent magnet. Attach it to a metallic surface and, voilà, you have a well-lighted, hands-free work area. EMERGENCY SIGNAL: In strobe mode, a row of 10 high-visibility red LEDs, also built into the handle, flashes incessant reliability to alert oncoming traffic of a disabled vehicle's whereabouts-all without the use of road flares. If you have any questions about this product by INGEAR, contact us by completing and submitting the form below. If you are looking for a specif part number, please include it with your message.